Hashtag app for Twitter and Instagram searches. Summer's here, and the time is right for apping in the street. 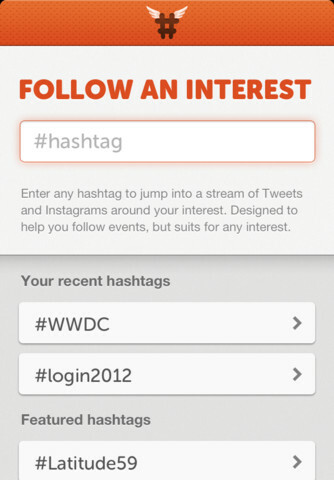 This cool, little app lets you to follow Twitter and Instagram topics at the same time using hashtag searches. Even better: when you're done searching, you can pick and choose the tweets and photos that interest you and create a Hastagraphic for reporting, storytelling, and sharing. Tweetbot was already the best mobile Twitter app on the market, but it's now integrated with Storify, so you can capture Twitter conversations, create a Storify story about them, and share it with planet Earth. This social-mobile-map app is supposed to be for "drivers" to make real-time updates to live maps. Yeah: bad idea. However, for car passengers and bus riders - like me - this app is nothing short of awesome. You can report construction, traffic jams, radar traps, and hazards in real time as you commute, giving everyone else a heads up before they head out. Roger, roger. Voxer turns your iPhone into a walkie-talkie. Text messages, photos, and - new! - audio, in real time or to play back later. One of the great smartphone apps, ReaddleDocs saves documents from emails, the Web, Dropbox, Box, and the storage service of your choice, so you can access them anytime from your iPhone or iPad. Digital business cards you can customize and share ("flick") from smartphone to smartphone or by email. The mobile check-in app underwent a big facelift last week. I never much cared for being "the mayor" of McDonald's, and I guess neither did anyone else: the app's new focus is on recommendations, not sticking it to your friends because you eat more McChickens than they do. Welcome to the new wave of apps vying to be "the Instagram of video" - filter, share, and (in the case of Bambuser) stream your video to friends, family, and your adoring publics. Build your mind maps for creative, business, or organizational purposes (or Euro 2012) and share them with your friends and colleagues online. What mobile apps are you lovin' these days? MapMyRun+ - it's an awesome app for tracking work outs. It has a built in gps to track your routes and it also allows you to build a friends list based off of Facebook or Twitter to keep track of friends' workouts. Oooh - very cool. I'll check 'em out. As much as I hate to admit it, the new Google+ app looks great. Shame about nobody using it though.